Following up the contacts you made at a trade show is nearly as important as making the contact in the first place. Many companies only do an e-mail follow-up, and miss the great opportunities that printed direct mail offers. Do you use direct mail on a regular basis? Yes? That’s good. But did you try it for event follow-up messaging, too? You should, it’s worth it! Fall is the season for trade show events—which means meeting with customers and business partners and also making new contacts that, hopefully, will turn into leads. 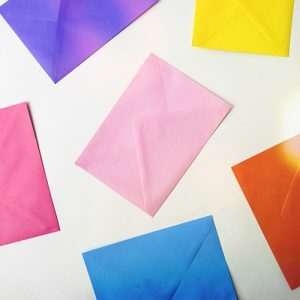 If you want to stand out from the ‘after event follow-up buzz’, you might want to consider creating a direct mail campaign. Despite the dominance of digital marketing, direct mail still remains relevant in B2B marketing. Plan the first month after a trade show to do your follow-up marketing. Some leads might not even be interested in doing business with you when making the initial connection, but they can definitely be turned around. You will want to schedule your follow-up printed direct mail or e-mail, consider your prospects reaction and have a corporate presentation info package at the ready to send out via e-mail. You can pre-write different versions for different industries that you can enrich with the contact person’s details. Sending out a printed direct mail that is signed by your own hand makes it even more personal and shows the recipient the effort and value you put into it. Remember: The follow-up is meant to build a connection to your leads—don’t make it a product roadshow! How about sending a (company-branded) give-away together with your direct mail piece!